First State Ballet Theatre, under the artistic direction of Pasha Kambalov, held the audience spellbound as it opened its 2015-16 season — its 16th as a professional company — with a gorgeous production of The Sleeping Beauty on Saturday, October 17 at The Grand Opera House in Wilmington. With music by Pyotr Ilyich Tchaikovsky and choreography by Marius Petipa, this beloved ballet has captivated audiences for more than a century. Generations have thrilled to its royal celebrations, magnificent castle scenes, magic spells, the battle of good and evil and the triumphant victory of everlasting love. 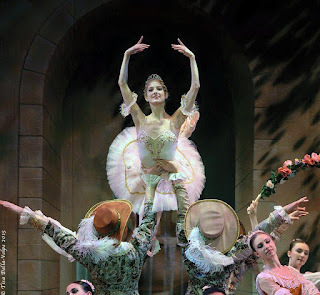 No ballet tests a company’s technical mettle more than The Sleeping Beauty, and this performance featured three hours of dazzling choreography, intricate pointe work and soaring jumps. The story gets off to a wonderful start as a sorority of fairy godmothers arrives at Baby Princess Aurora’s christening, bestowing on her all the gifts she will need in life. These masterful ballerinas glided across the stage with such grace and ease that it looked effortless. The plot gets rolling after the passage of 16 years when the court celebrates the now marriageable Aurora’s birthday. The lovely and lissome Mary Kate Reynolds reprises her role as the condemned princess, displaying all the sprightliness and joy one would expect of a teenage character in the bloom of life. She seemed to hover in the air, skimming the stage with a light pas de chat. The role calls for a master turner and Reynolds executed every pirouette with grace and precision. The handsome Justin Estelle danced the role of Prince Desire who kisses and awakens Aurora from a 100-year sleep, imposed by the slighted evil fairy Carabosse (danced by a deliciously diabolical Aubrey Clemens). From the moment he appeared in the hunting scene, Estelle commanded the stage with a proper air of aristocracy and exciting yet tasteful and elegant dancing. His gravity-defying feats were among the most impressive highlights of the ballet. There was no shortage of chemistry between him and Reynolds. And there was much more to appreciate, whether it is in the wisdom and dreaminess of Lauren Frere’s Lilac Fairy, the lightness of Rie Aoki and Leonid Goykhman’s “Bluebird pas de deux,” the playfulness of The White Cat (Angela Zielen) and Puss-in-Boots (John Brewer) or the engaging Master of Ceremonies (Jake Nowicki). Jake Allison and Anna Carapellotti offered a proud and dignified King Florestan XIV and Queen, respectively. Aside from the breathtaking dancing, the costumes were true stand-outs in this production, perfectly complementing the performers, from the Lilac Fairy’s sparkling purple tutu to the dark robes of the evil Carabosse and her minions. This “Sleeping Beauty” was a magnificent piece of art, from slumber to awakening.